Renting is trending!! Why purchase the product and pay a heavy amount when you can rent it without much load on your pocket. 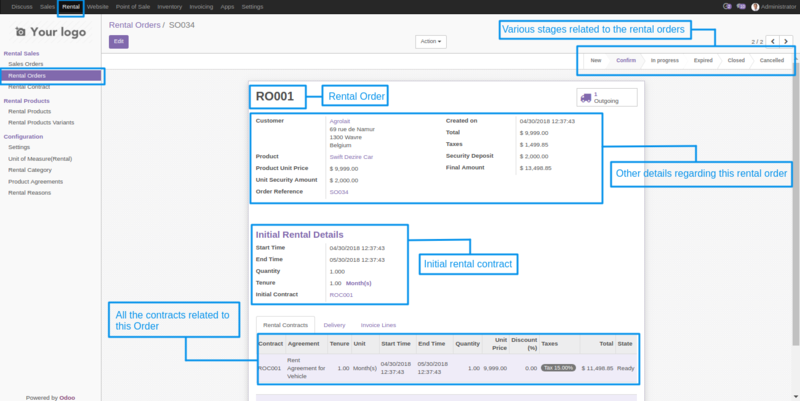 Hence considering the demand of rental management we have introduced our module Odoo Rental Sale which will help you to manage rental products, rental tenure schemes, rental orders, rental contracts, incoming delivery, outgoing delivery etc in an easy and efficient way. Renting business can be that model which can provide you the path to earn huge revenue and establish a sound business. 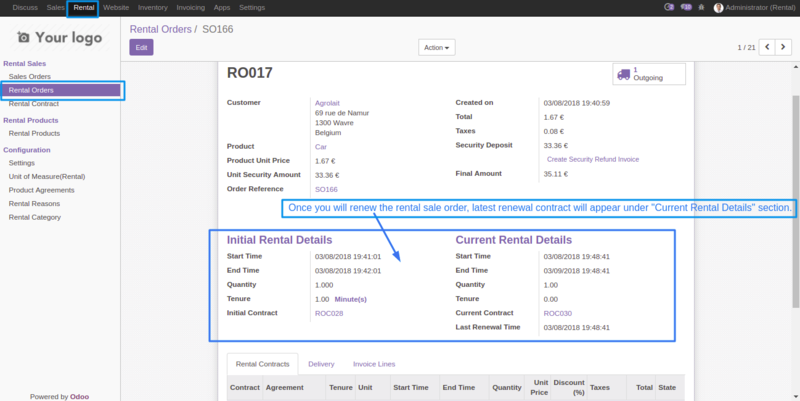 Odoo Rental Sale Module can be a smart investment if you want to establish your business for a long run. 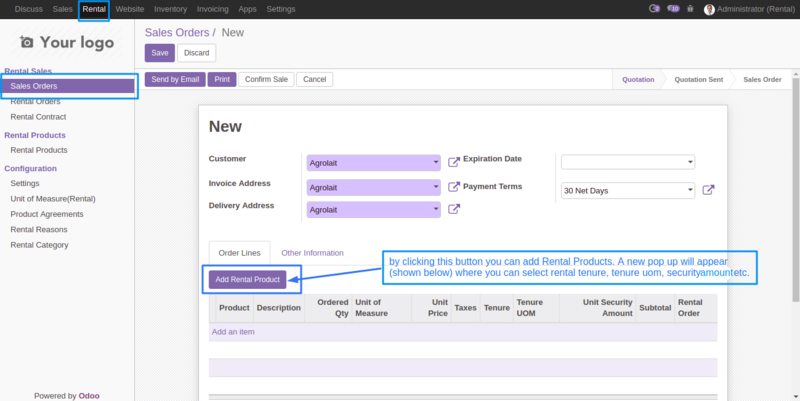 Sales Manager can create Rental Products. After buying this app from our Webkul store you will get the link for downloading the zip file. Simply download it and extract then you will see the odoo_sale_rental folder, now you will have to copy this app folder inside your Odoo addons path. 3. 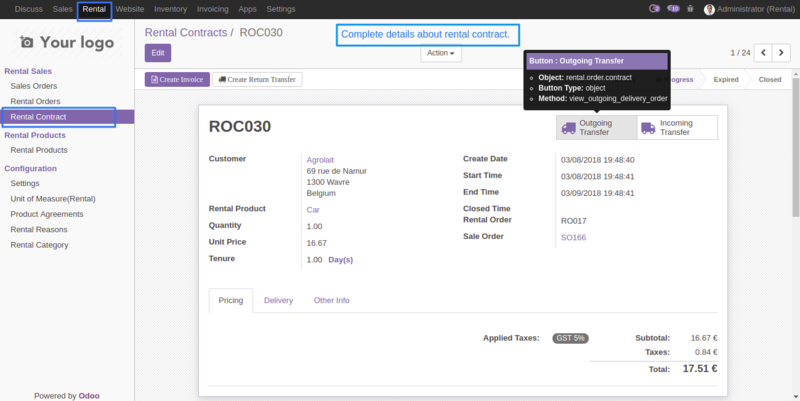 Remove the app’s filter and search for the odoo_sale_rental key. Let us start with the configuration of this module. 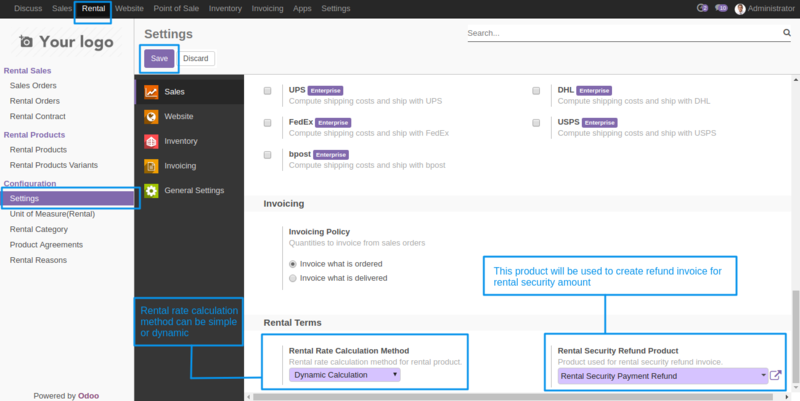 Under Rental terms, the admin can set rental sale calculation method either Simple or Dynamic. On the Rental security refund product, the ” Rental security payment refund ” product is to be selected. Rental Rate Calculation Method: There is two options in rate calculation method. In simple calculation method, rental amount will be calculated by using smallest rental tenure scheme. For example: If the product has following rental tenure scheme. Rent for 1.00 days is $150.00. Now if the customer will buy this rental product for 6 days then charges will be calculated based on smallest rental tenure scheme 1.0 day @ $150.00. In dynamic calculation rental amount will be calculated dynamically. This method first finds closest rental tenure scheme then again for remaining tenure and so on. For 1.00 days rent will be applied according to 1.0 day @ $150.00 rental scheme. 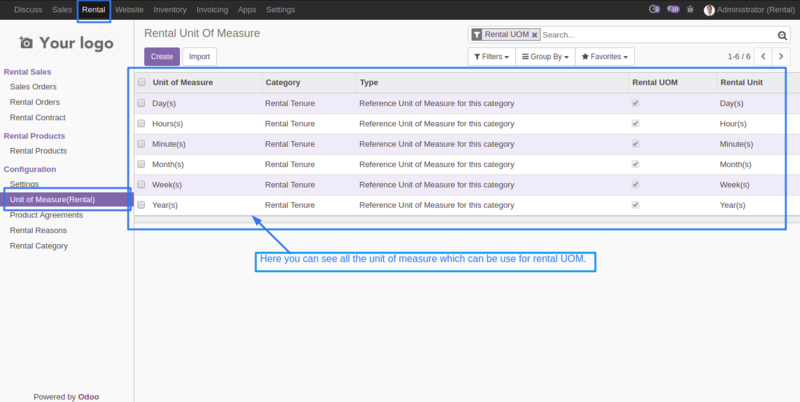 From the menu of Rental Unit of measure, you can create all the unit of measures that will be used as rental UOM. 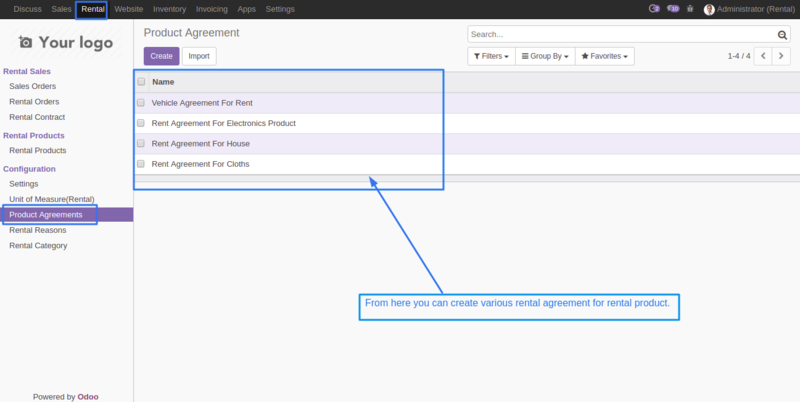 Under the menu of Product agreement, you can create various agreements which will be further used for rental products accordingly. As per the business demand, there may be a need for the different rental category so from the menu of the Rental category you may create a different category as per need. 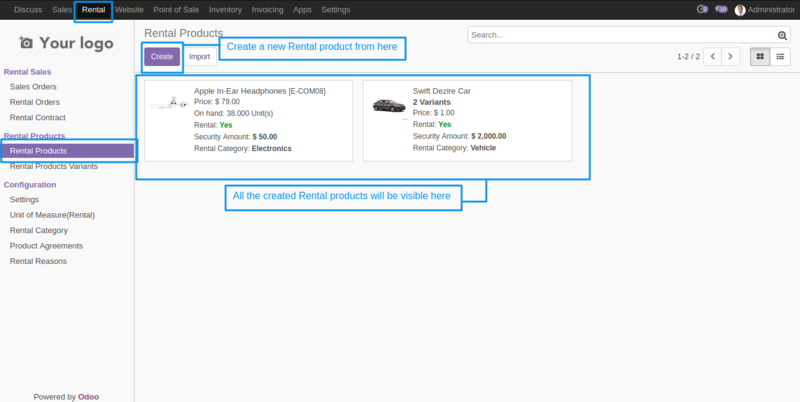 Now to provide products for rent you need to create Rental products. From the menu Rental products, you may create and check the products available for rent. 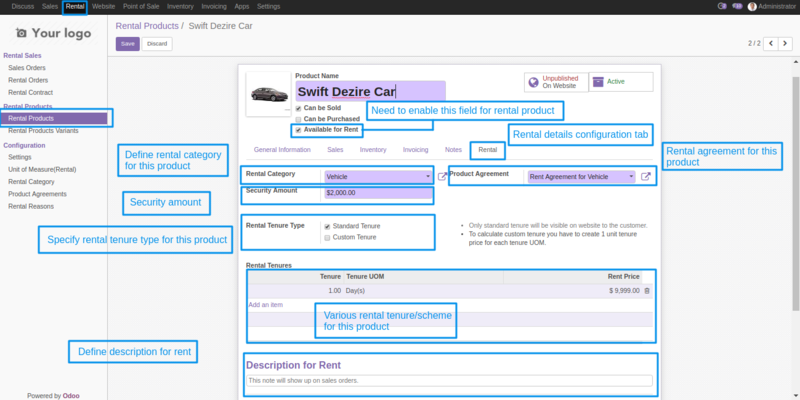 Here is the various field you need to fill under the tab of Rental. There are possibilities that a product may have different product variant. 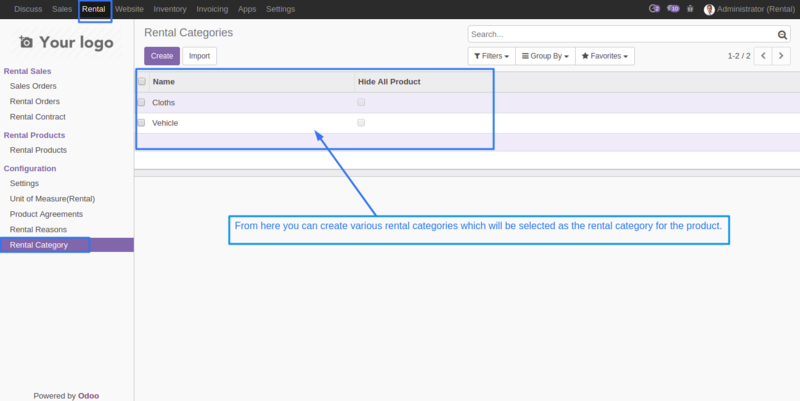 Hence from the Rental product variants menu, you may create and check all the rental product variants. Sale order under the Rental Tab. 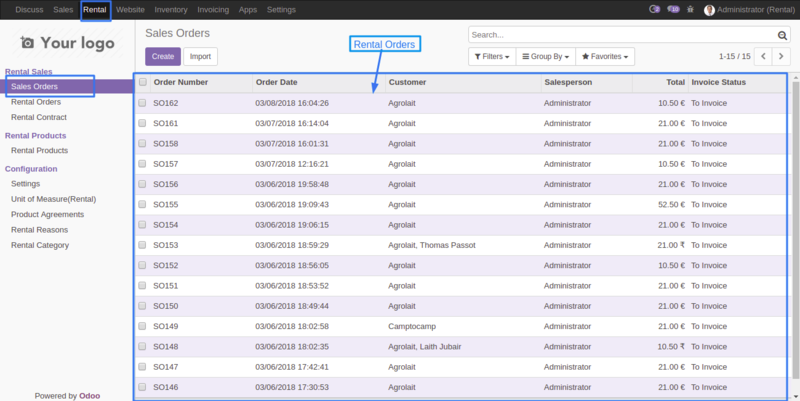 From the menu of a sales order, you may create a new sales order for the rental product. 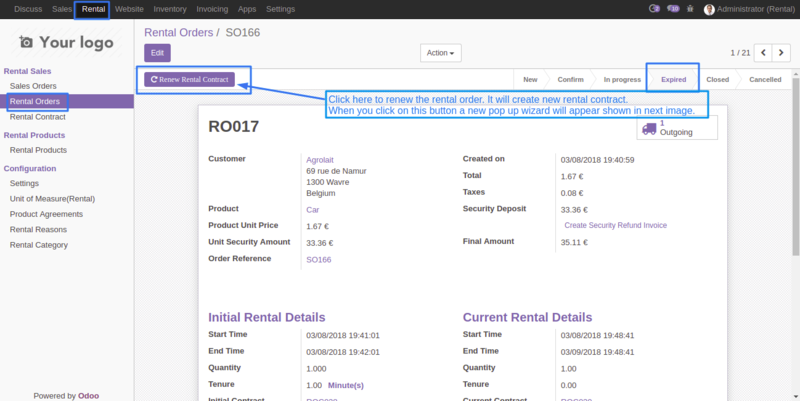 Here you will find a button to add a rental product by clicking which a pop-up will appear where you can select rental tenure type, scheme etc. 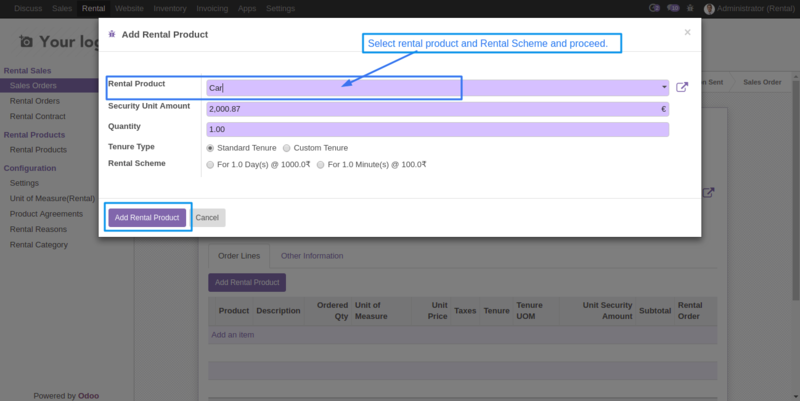 On the Pop-up box select rental product, fill the security amount, define the Quantity, choose tenure type and the rental tenure. 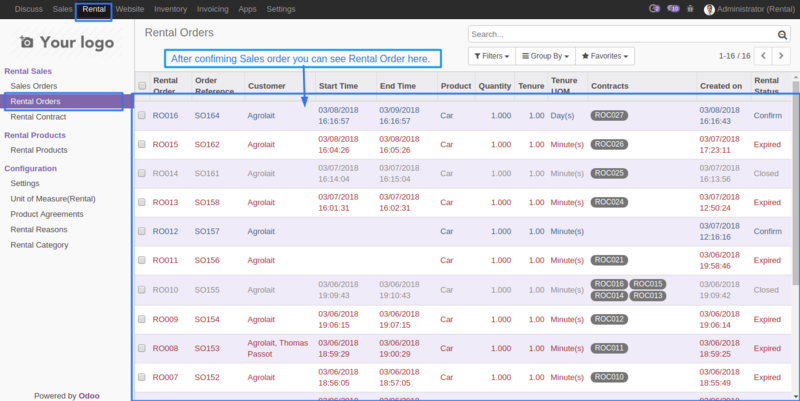 Once the Sales Order is confirmed you can see the sales order under the rental order menu. By selecting any of the rental order you can see complete details of that rental order along with its stages. Also, you may check the delivery and invoice line details under their respective tabs. By clicking on Renew Rental Contract you can renew the expired rental order. When you click a new pop-up window will appear shown in next image. Here you may select the desired rental tenure and renew the expired contract. Both current rental details and Initial rental detail will be updated after renewal. 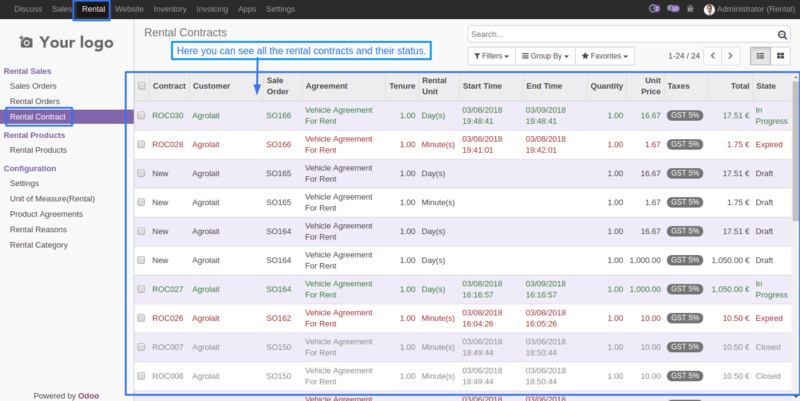 From the rental contract menu, you can check all the rental contracts along with their status. 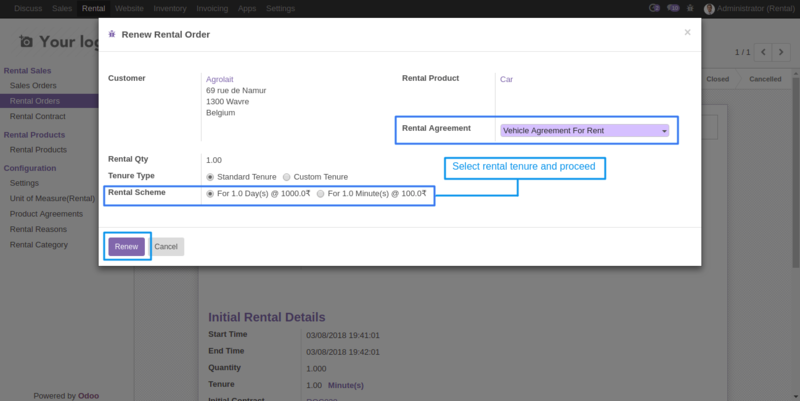 By clicking on a particular contract you can see complete detail about the rental contract.